The black-tailed prairie dog habitat in the American Grasslands is one of the most popular immersive experiences at the Detroit Zoo. Kids can get nose-to-nose with the inhabitants inside viewing bubbles placed within the habitat. The prairie dogs spend much of their time building and maintaining their underground town, consisting of multiple entrances and exits. Other times they forage for food, cuddle with each other or “kiss” members within their family. Working as a team, these furry diggers communicate through vocalizations — a high shriek will alert fellow prairie dogs if perceived trouble is afoot while a calm call relays that all is well. The prairie dogs can be found west of the bison. Black-tailed prairies dogs have small ears, short legs and sharp claws. As their name suggests, the tips of their tail are black. Their fur is mainly brown with some gray. 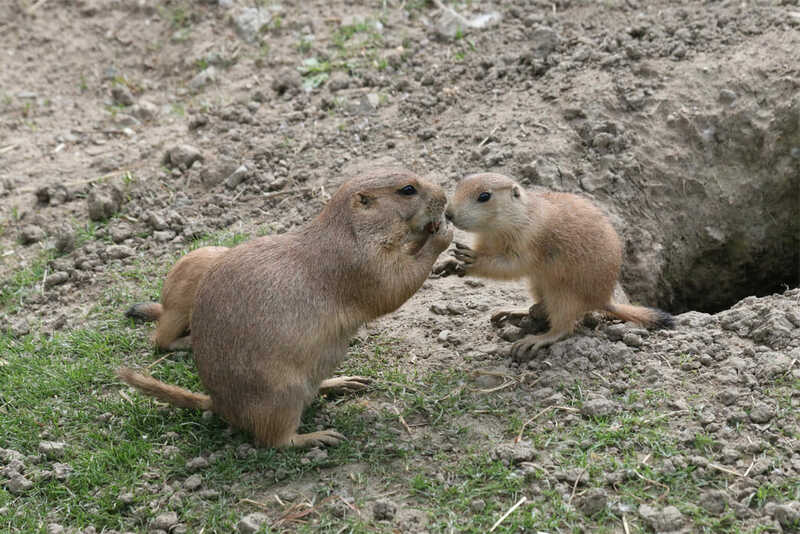 Prairie dogs are very social; when they greet each other, it looks as if they are kissing. A female prairie dog is only able to breed one day of the year. If she misses that day, she’ll get another chance to mate 13 days later. These iconic little ground squirrels once lived in vast prairie dog “towns” that spread across miles of prairie in the American west. Their tunnels include various “rooms” that are used for different reasons such as nurseries, toilets, sleeping chambers and listening posts. The black-tailed prairie dog is an herbivore and eats grasses and roots.